Former minister rejects PM's claims that he plotted to take the mandate to form the next government. 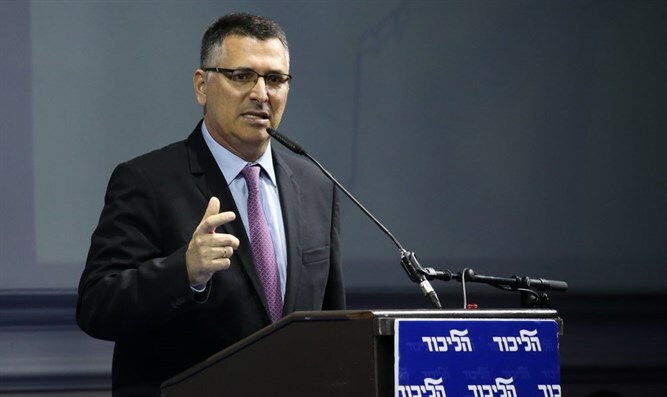 Former Likud minister Gideon Sa'ar on Monday evening rejected Prime Minister Binyamin Netanyahu's claims that Sa'ar was "plotting" to take from President Reuven Rivlin the mandate to form the next government in place of Netanyahu. "Prime Minister Netanyahu twice created and disseminated a fake plot: Once at his birthday party, and again at the inauguration of the Likud TV. This is meant to attack me on the eve of the primaries,” Sa’ar told Channel 12 News. "It began with fabricated stories about a conspiracy with the president. He went on to say that I did it with elements in the coalition and now there is a claim that I did it with elements in the Likud - and everything is anonymous." "The prime minister is the Likud candidate for prime minister, and I stand behind him as I always did," Sa'ar stressed. "I will recommend to the president that the government be formed only by Binyamin Netanyahu. Only if I am elected by a majority of the Likud members will I form a government - until that happens, I am a loyal soldier of the Likud and of the way of the Likud, and that is above personal matters." "They take advantage of my statesmanship and responsibility," Sa'ar continued. "For two years they have been conducting a campaign of persecution against me - the prime minister, his employees, members of his family - all of them are pressuring activists, mayors and Knesset members who dare to attend our conferences. I said nothing until now, because I have responsibility, but the fact that I respect the prime minister does not mean I should allow my reputation to be harmed. Whenever there is such an attack I will stand up for the truth, the truth will defeat the lies. " "I will insist that the prime minister be entitled to due process - to come and conduct discussions today as if it was already decided to file an indictment against him violates the right to due process. I will not lend a hand to violating this right, it is part of the rule of law," added Sa’ar.